And we have a budget! Just getting home after a long meeting, but a substantive one: the Board had a lengthy budget discussion and passed the 2013-14 district budget unanimously. The district will receive $360.58 million in unrestricted general fund revenues and spend $378.424 million, drawing down the beginning balance of $34.102 million to about $700,000 after the required $15.566 million reserve. The special education budget is bigger than ever, representing about 25 percent of the general fund when special ed transportation costs are included — Commissioners are increasingly worried that the annual growth in special education spending is unsustainable and asked for more clarity on how the district expects its current investments to pay off in reduced future costs and better academic outcomes. The CAC for Special Education has posted some great analysis and data on its web site; committee members spoke at the Board meeting and expressed concern that the district’s plan to invest in professional development and coaching for teachers — while needed — might divert too much money away from the classroom. My personal feeling is that while accelerating expenditures are alarming, it’s not time to change course: we have been identified as significantly disproportionate in how we identify students of color for special education, and are now required to spend 15 percent of our Federal special education allocation on interventions in general education. General education teachers desperately need more tools to help students who are struggling achieve, so that special education is not the district’s only safety net for students who aren’t achieving at grade level. Coaching and professional development are the best ways to provide general education teachers with the tools they need. We’ve reduced our spending on out-of-district private school placements for students with disabilities, by almost $5 million since I got on the Board. But our choice-based student assignment system increases our special education transportation costs, and one of my goals over the next year or two is to look at ways to maintain equitable treatment of students with disabilities in our system while decreasing our exposure on transportation. Overall, though, I think the request for more clarity in the district’s expectations and strategies for the next few years would be a good thing and I support the need for vigilance in gauging the return on our increasing investments in educating our students with disabilities. 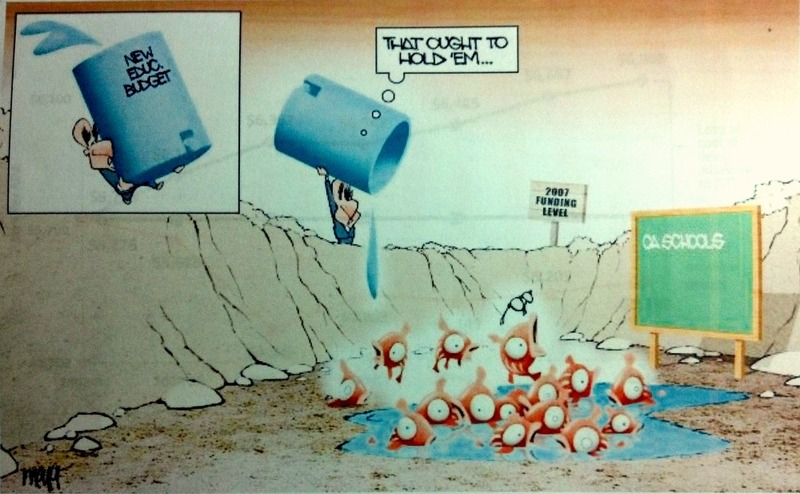 One of the Superintendent’s centerpiece initiatives — Multi-Tier Systems of Support, or MTSS–is still confusing for board members and members of the public. Essentially, the initiative seeks to place resources where they are most needed, so that schools that need more supports get more supports even as all schools get a base “package” that includes ample counselors, nurses, librarians and other support staff. Fully-realizing this vision will take more money than we currently have, but there have been significant investments in the current budget in social workers, counselors and nurses for many schools. Elementary area teams will now consist of an Assistant Superintendent, and Executive Director, a Family and Community Engagement Specialist, two teachers on special assignment who can provide instructional support to principals and schools, as well as clerical support and a small discretionary budget. The expectation that goes along with this is that area teams will be more effective and proactive at problem-solving so that complaints are less likely to languish and fester. Some Board members worry, however, that this represents a big expansion in central administration, and that it represents a dismantling of site-based autonomy and decision-making. The 7-period day for high school: Tonight Commissioner Haney introduced a resolution urging the district to expand A-G qualified course offerings at high schools; the Superintendent introduced a proposal that would lessen the credit requirements for students attending continuation or county high schools. Both resolutions will be discussed in August when the Board reconvenes after its July recess. Most of us agree that our students will have a much easier time meeting the more stringent A-G graduation requirements in place for the Class of 2014 and beyond if we are able to offer a 7-period day, but it’s expensive and Board members wanted to know how the Superintendent proposes to get there. Similarly, common planning time for teachers is a widely-endorsed way to improve student outcomes, and Vice President Fewer introduced a resolution last summer asking the Superintendent to implement common planning time at all schools by the end of this year. However, the Board has not voted on this resolution as yet because transportation and other logistical issues make it daunting to fund and implement. Board members also asked how to make common planning time a reality in coming years, given our belief that it is a best practice in improving achievement. That’s it for now: I’m going fishing for the month of July (metaphorically, not literally. As my husband likes to say, fishing is boring until you catch a fish–then it’s disgusting. And sorry for all the fishing references). I’ll start blogging again in August. Happy summer vacation everyone! Sometimes, things happen to reinforce my faith that good things are happening in this school district, despite all the angry e-mails I get. Today, I had the absolute pleasure of attending the unveiling of a mural at the Ruth Asawa School of the Arts, created by two students from the Community Access Transition (CAT) class at the school. (Students in CAT classes are over the age of 18 but, due to their individual needs, still eligible for special education until the age of 22). The CAT teacher at SOTA, Heidi Hubrich, noticed that two of her students had particular drawing abilities, and arranged for them to work with artists at an amazing local program, Creativity Explored. Every Wednesday for almost a year, Steven Liu and Joel Kong worked with artist Larry Morace on drawing. Mr. Morace quickly noticed that Steven was especially talented at landscapes; Joel was especially talented at portraits. Both young men are extremely loyal to their hometown of San Francisco, and blossomed as artists when they began to visit locations around the city to find subjects to draw. Out of Steven and Joel’s work with Mr. Morace, a mural honoring San Francisco subjects was born. The mural is a lovely and inspiring artistic achievement in and of itself, but in the true spirit of SOTA (and its patron, Ruth Asawa), other student artists noticed the work and responded in kind. Two juniors in the Media Arts program created a five-minute documentary (which I am seeking to show at the March 22 Board meeting) about Steven and Joel and their mural. A student in the Creative Writing program wrote a poem about it. And today, artists and supporters from Creativity Explored, SOTA students and faculty, Steven, Joel and Heidi’s family members and many others gathered at SOTA to view the completed mural for the first time, celebrate the universal appeal and accessibility of the arts, and honor artists of all abilities. Today’s event felt like a peek into a future we know can be in all of our schools – where students are respected, accepted and celebrated for what they CAN do rather than sorted based on what they CAN’T. It was lovely. The next time you are visiting SOTA, check out the mural right next to the door to room 208, Ms. Hubrich’s CAT class, and pause for a moment to think about whether the “dis-abilities” of the artists really matters. 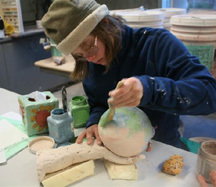 Today I learned the appalling story of Eliza Schaaf, a 20-year-old woman with Down Syndrome who enrolled in an “Introduction to Ceramics” course at Southern Oregon University as a non-credit student (the university calls this “non-admitted status”) this Fall. In the letter, O’Bryan stated that Schaaf’s enrollment at SOU was a “novel situation” for the university. “The non-admitted policy was not designed or intended to provide an avenue for participation to individuals who are not otherwise qualified for admission to SOU,” O’Bryan wrote. I hereby wish to invoke the power of the Internets to show Southern Oregon University how wrong-headed they are by failing to see the benefits (let alone the moral imperative) of including a person with a disability. Stories abound of students with Down Syndrome, like Eliza, who are now attending college — Katie Apostolides of Massachusetts is one example (she’s been profiled in The New York Times and U.S. News & World Report); former prom king Zach Wincent of Illinois is another. Last year, our own CSU-East Bay announced plans to create a college program for students with autism. It’s happening, Dean Laura O’Bryan of Southern Oregon University — 35 years after the signing of IDEA, students who have experienced inclusive environments throughout their K-12 educations are now knocking on the doors of colleges like yours. Eventually, they’re going to gain access. Wouldn’t it be better if you figured out a way to welcome them?